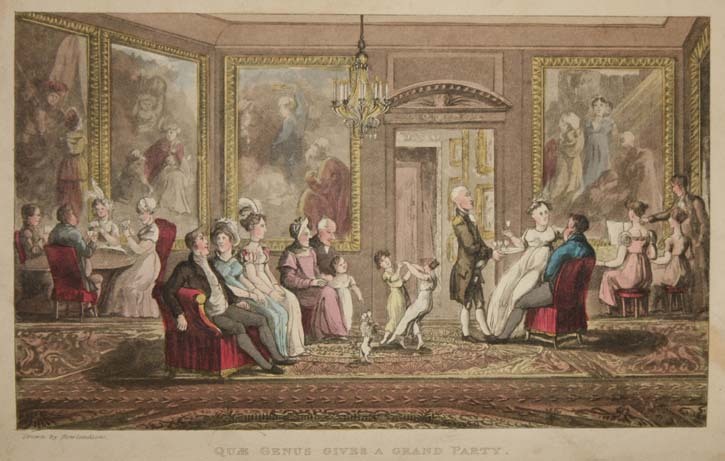 When one imagines a party in London during the Regency era – like the soiree at which the Duke of Wellington learns of Napoleon’s escape in Napoleon in America – one tends to think of lavish rooms, pretty gowns, and fancy dancing. Less thought is given to the work the hostess had to do to get her house ready for the party. This was considerable, even if she did have servants to help her. Regardless of the type of party, a lot had to be done to get the house ready. Lady Morgan provides a peek at what went on in one London house just before a big Regency party. It is no joke [to give a party] even in London, where every thing is to be hired, from the chairs to the company; where ‘society to let,’ has been a sign set up by more than one leader of ton, ready to fill the house of any Mrs. Thompson, or Mrs. Johnson, upon the understood terms of no meddling on the part of the hostess, and no obligation to make a due return on the part of the guests. What is strange in all this toil of pleasure is that not only the good sort of people have a great deal to do, in getting up a party, but that the great themselves (such of the great as do not live in the ‘houses’ modelled on a French hotel), have nearly as much trouble to make ‘ample room and verge enough’ to suffocate their friends commodiously, as the twaddles in Bloomsbury, the tabbies of Finsbury, or the dwellers in any other terra-incognita of Mr. Croker’s topographical map of fashion. I once caught a certain ‘bonnie duchess’ up to her eyes in lamps and loungers, garlands and wax lights, and the rest of the materiel for a party, an hour before the throwing open of her rooms to that ‘world,’ which her talent and pleasantry so long governed and cheered. As I was a Missy, her good-natured grace had bid me come very early, that she might see how I was dressed: for she took a kind interest in me, for no other reason that I know of, except that I stood in need of it. Early, therefore, I went, but so early, that all the behind-the-scenes bustle was still in its fullest activity. The Duchess of — then resided in Lord A—st’s house, which afforded quarters much too circumscribed to hold her legions of fashion; and all her ingenuity was applied in order to make crushing room for five hundred particular friends. What a hurry-scurry! Footmen, still in their jackets, running about with lights to place and replace, like the clerical scene shifters in Santa Maria Maggiore at Rome, on a Christmas eve, – the porter, half-liveried, the page half bedizened, and the French femme-de-chambre, with her hands in the pocket of her silk apron, chattering to every body, and helping nobody! All this was very striking, but very comfortless; so I sauntered out of one room into another, and had just drawn near to the only fire I met with in the suite, when a loud hammering behind me induced me to look back; and there, mounted on a step-ladder, stood a bulky, elderly lady, in a dimity wrapper, and a round-eared cap, knocking up a garland of laurel over the picture of some great captain of that day, military or political (I forget which), while an argand lamp burned brightly before it, – a votive offering to the idol of the moment! According to Lady Morgan, the party turned into “one of the most agreeable” she ever attended. But if a party didn’t turn out as well as one hoped, there was apparently no need to worry. William Parkes, Domestic Duties; or, Instructions to Young Married Ladies, on the Management of their Households, and the Regulation of their Conduct in the Various Relations and Duties of Married Life (London, 1825), p. 81. Sydney, Lady Morgan, The Book of the Boudoir, Vol. I (London, 1829), pp. 170-173. Brilliant blog post, well researched. Thank you for sharing this! Thanks, Christoph! Glad you enjoyed it. I think we could go along with most of the suggestions you gave, except for the timing of supper. Half past twelve or one o’clock, never later… would be far too late now. Guests can hang out until 10 or 10.30 these days but only if the hosts provide plenty of nibbles in the meantime. It amazes me how late these parties regularly went – either the bon ton weren’t early risers, or there must have been a lot of napping going on! I once caught a certain ‘bonnie duchess’ up to her eyes in lamps and loungers, garlands and wax lights, and the rest of the materiel for a party, an hour before the throwing open of her rooms to that ‘world,’ which her talent and pleasantry so long governed and cheered.